Tottenham clinched a stunning 3-0 win over Borussia Dortmund to put one foot in the Champions League quarter-finals. Nick Wright reports on a major statement of intent from Mauricio Pochettino's men at Wembley. The drums were sounding and the flags were waving long before kick-off in the yellow-and-black away section at Wembley. Borussia Dortmund supporters bounced in unison, their songs echoing around the stadium, but by the final whistle they were silent. By then, 'Glory, glory Tottenham Hotspur' was the soundtrack as Spurs savoured a memorable victory. Such an outcome looked implausible at the halfway point. Tottenham were second best, indebted to Hugo Lloris for keeping them level as they laboured without Harry Kane or Dele Alli, but not for the first time lately, they dug out a response when they needed it most. Heung-Min Son's opening goal arrived straight after the break and Spurs did not look back. Mauricio Pochettino preached caution in his post-match press conference, insisting the job was only half-done and that Spurs will approach the return leg in Dortmund "with the idea to win", but deep down he will be aware that a Champions League quarter-final is well within his reach. The brilliant, curling cross from which Son scored the opening goal changed the direction of the game and it was not the only time his delivery caused Dortmund problems. Over the course of the 90 minutes, he produced more open play crosses than any other player. His goal, superbly taken from Serge Aurier's delivery, capped a man-of-the-match display. Vertonghen was helped by the defensive support of Toby Alderweireld, who was moved from the right to the left of Tottenham's back three, while Juan Foyth was similarly impressive on the other side. The 21-year-old had a horrible moment when he lost possession near his own box early on, but regained his composure to earn the praise of his manager. "It's not important the name, it's not important the experience, it's not important whether he's 20 years old or 30 years old," said Pochettino. "He made a few mistakes because he wanted to play, but I prefer a player who wants to play. I love a player who is brave and takes risks like he does." Foyth was not even included in Tottenham's Champions League squad back in September, but he is not the only squad player who has stepped out of the shadows this season. Harry Winks has become a key figure and he was outstanding again on Wednesday, completing 67 of his 72 passes in midfield and making a string of important tackles and interceptions. Then, of course, there is Son. The South Korean's qualities have long been obvious to everyone at Spurs, but it is only now, in the absence of Kane and Alli, that he has taken centre stage. His goal was his fourth in as many games since his return from the Asian Cup. He ran himself into the ground before he was substituted to a standing ovation in stoppage time. The combination of industry and quality had Pochettino beaming with pride afterwards. "Many things happen and the team is fighting, getting results, I feel so proud for that," he said. "My players are heroes, whatever happens, they deserve full credit and a lot of praise. What they are doing this season is amazing." It certainly looks as though it will haul them into the last eight of the Champions League, and why shouldn't they go further? 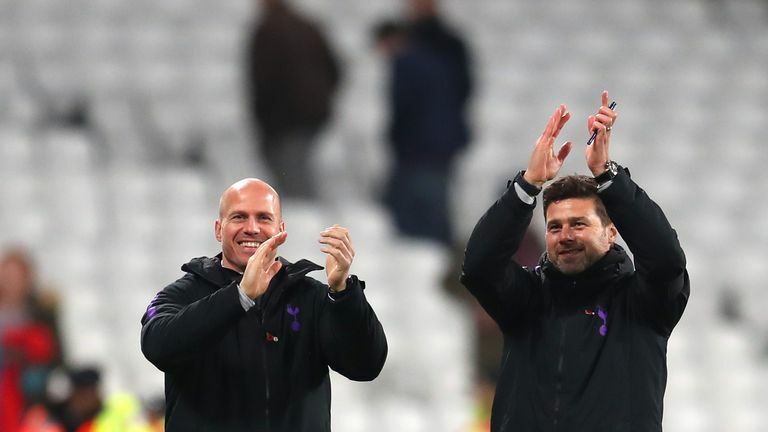 Tottenham have defied expectations all season, and they should be considered genuine contenders now. The Borussia Dortmund supporters who were stunned into silence at Wembley would surely agree.